Awareness Information – Remember storm chasing is not a safe activity. If there is a tornado warning for your area do not go out to chase the tornado. Many people have died trying to get a look at a tornado out of curiosity. Tornadoes may appear nearly transparent until dust and debris are picked up. Stay alert for high winds even if you do not “see” a tornado. It used to be advised to go to the southwest corner for safety; however, the southwest corner of a house is no safer than any other corner. Historical information has shown that any corner on the lowest level away from windows is as safe as any other corner. 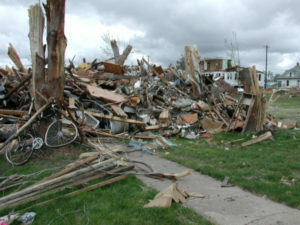 If tornado winds enter the room, debris has a tendency to collect in corners. When selecting a tornado “safe place,” look for a place on the lowest level and away from windows, preferably in a small room (closet or bathroom) in the center of the house. Closer walls will help provide more support to the roof, and each wall between you and the outside will provide further protection. If you live in a mobile home, choose a safe place in a nearby sturdy building. A sturdy building provides greater protection. If your mobile home park has a designated shelter, make it your safe place. 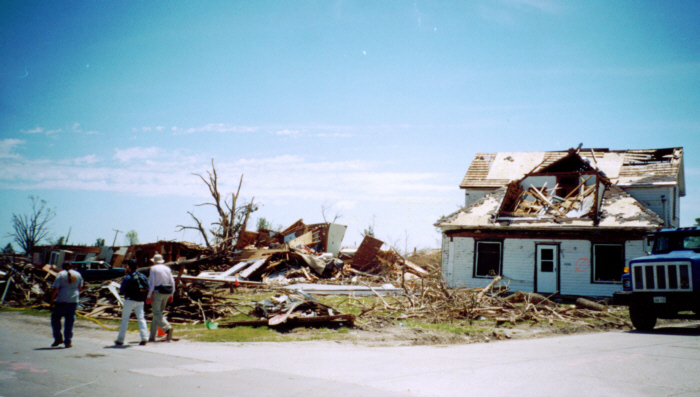 Mobile homes are much more vulnerable to strong winds than site-built structures. Prior to 1994, most manufactured homes were not designed to withstand even moderate winds. Mobile homes are not safe in a tornado so have a sturdy building picked out ahead that you will go to if a tornado warning is issued. Discuss how you would be warned of an approaching tornado. Different communities have different ways of providing warnings. Many communities have sirens intended for outdoor warning purposes. Use a NOAA Weather Radio with a tone-alert feature to keep you aware of watches and warnings while you are indoors. Learn about your community’s warning system. Make sure all family members know the name of the county or parish where you live or are traveling, because tornado watches and warnings are issued for a county or parish by name. Learn about your community’s warning system. Different communities have different ways of providing warnings. Many communities have sirens intended for outdoor warning purposes, many have no sirens at all. Use a NOAA Weather Radio with a tone-alert feature to keep you aware of watches and warnings while you are indoors. Check with your work and your children’s schools and day care centers to learn tornado emergency plans. Every building has different safe places. It is important to know where they are and how to get there in an emergency. Keep your bike, motorcycle and rollerblade helmets in your safe area. This way when you have to take shelter the helmets are there waiting for everyone to put on. Find safe places in your home and classroom. Make sure these places are away from windows and tall furniture that could tip over. In your safe place, get under something sturdy, or use a large, hard-cover book to help protect your head and neck from flying or falling objects. Locate safe places outside in case you are not able to go inside. Frequently, children in schools are told to move to the inner hallways away from windows. Children need to know that a tornado safe place is not the same as a fire meeting place. Wherever you are, if you hear or see a tornado coming, take cover right away. 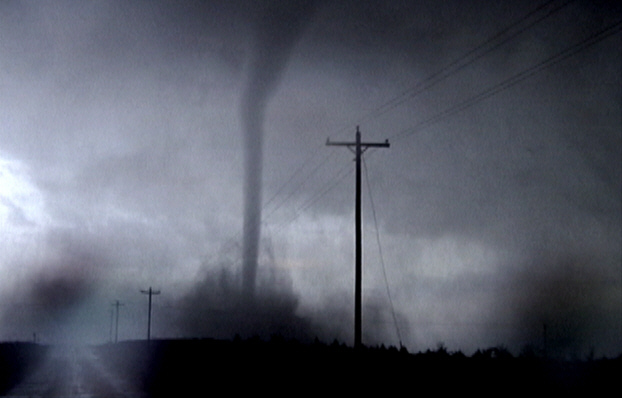 Tornadoes can move quickly, blowing objects at very high speeds, even if they are a distance away. Protect yourself from flying debris by taking cover immediately. If you’re in a house or apartment building and a tornado threatens, go to the lowest level – a basement or storm cellar if possible. Once on the lowest level, go to the middle of the building away from windows, into a bathroom or closet if possible. The safest place to be is under the ground, or as low to the ground as possible, and away from all windows. If you have a basement, make it your safe place. If you do not have a basement, consider an interior hallway or room on the lowest floor. Putting as many walls as you can between you and the outside will provide additional protection. Make sure there are no windows or glass doors in your safe place and keep this place uncluttered. Get under something sturdy, such as a heavy table, hold on and stay there until the danger has passed. Being under something heavy will help protect you from falling objects. If tornado wind enters the room and the object moves, holding on with one hand will help you move with it, keeping you protected. Use your other arm and hand to protect your head and neck from falling or flying objects. Your head and neck are more easily injured than other parts of your body. Protect them as much as you can. If you have a bike, motorcycle or rollerblading helmets put them on your children. If you’re outside in a car or in a mobile home, go immediately to the basement of a nearby sturdy building. Sturdy buildings are the safest place to be. Tornado winds can blow large objects, including cars, hundreds of feet away. Tornadoes can change direction quickly and can lift up a car or truck and toss it through the air. Never try to out-drive a tornado. Mobile homes are particularly vulnerable. A mobile home can overturn very easily even if precautions have been taken to tie down the unit. If there is no building nearby, lie flat in a low spot. Use your arms and hands to protect your head. Tornadoes cause a lot of debris to be blown at very high speeds, and you can be hurt by this debris if it hits you. Dangerous flying debris can be blown under highway overpasses and bridges, or weaker overpasses and bridges could be destroyed. You will be safer lying flat in a low-lying area where wind and debris will blow above you. Tornadoes come from severe thunder- storms, which can produce a lot of rain. If you see quickly rising water or flood water coming towards you, move to another spot. If you have additional space, consider adding some of the items from your Evacuation Supplies Kit. A highway map to follow storm movement from weather bulletins. Sponsor a “Helping Your Neighbors” program at your local schools to encourage children to think of those persons who require special assistance, such as elderly people, infants, or people with disabilities. Use a NOAA Weather Radio with a tone-alert feature to keep you informed of watches and warnings issued in your area. The tone- alert feature will automatically alert you when a watch or warning is issued. Watch for tornado danger signs. Tornadoes may happen so quickly warnings can’t be issued long in advance. Pay attention to weather clues around you that may warn of imminent danger. If you live in a single-family home in a tornado-prone area, find out how to reinforce an interior room on the lowest level of your home (such as the basement, storm cellar, bathroom or closet) to use as a shelter. Plans for reinforcing an interior room to provide better tornado protection in your home are available from your local emergency management office or from FEMA’s Surviving the Storm. 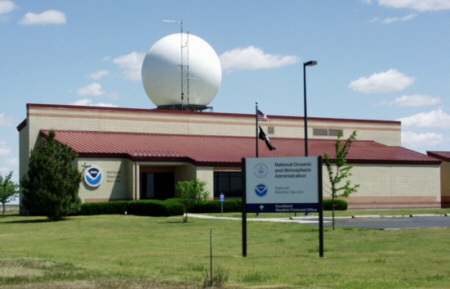 Listen to a NOAA Weather Radio or local radio or television stations for updated information. Tornadoes can change direction, intensity, and speed very quickly. Be alert to changing weather conditions. 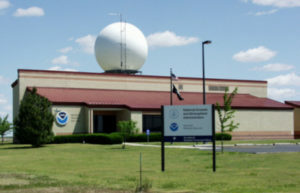 Tornadoes accompany severe thunderstorms, and weather conditions can change rapidly. Large hail, blowing debris, or the sound of an approaching tornado may alert you. Many people say approaching tornadoes sound like a freight train. Listen to a battery-powered NOAA Weather Radio, regular radio, or television for updated information. If the electricity should go out, you will still be able to receive emergency information. Use your other arm and hand to protect your head and neck from falling or flying objects. Your head and neck are more easily injured than other parts of your body. Protect them as much as you can. If you have a helmet put it on when you go to your shelter. If you’re outside in a car or in a mobile home, go immediately to the basement of a nearby sturdy building. Sturdy buildings are the safest place to be. Tornado winds can blow large objects, including cars and mobile homes, hundreds of feet away. Tornadoes can change direction quickly and can lift up a car or truck and toss it through the air; never try to out-drive a tornado. Mobile homes are particularly vulnerable. A mobile home can overturn very easily even if precautions have been taken to tie down the unit. Help a neighbor who may require special assistance – infants, elderly people and people with disabilities. Elderly people and people with disabilities may require additional assistance. People who care for them or who have large families may need additional assistance in emergency situations. Watch out for fallen power lines or broken gas lines and report them to the utility company immediately. Reporting potential hazards will get the utilities turned off as quickly as possible, preventing further hazard and injury. Avoid disaster areas. Your presence might hamper rescue and other emergency operations, and put you at further risk from the residual effects of tornadoes. Stay out of damaged buildings. Tornadoes can cause great damage, creating further hazards. If you are away from home, return only when authorities say it is safe. When entering damaged buildings, use extreme caution. Moving through debris presents further hazards. Carefully watch every step you take. Look for fire hazards. There may be broken or leaking gas lines, or damage to electrical systems. Clean up spilled medicines, bleaches, gasoline, or other flammable liquids immediately. Fire is the most frequent hazard following other disasters. Check for gas leaks. If you smell gas or hear a blowing or hissing noise, open a window and quickly leave the building. Turn off the gas using the outside main valve if you can, and call the gas company from a neighbor’s home. If you turn off the gas for any reason, it must be turned back on by a professional. Take pictures of the damage, both of the building and its contents, for insurance claims. Sometimes insurance companies can delay payment for tornado damages so policyholders who need help should be aware of their rights. 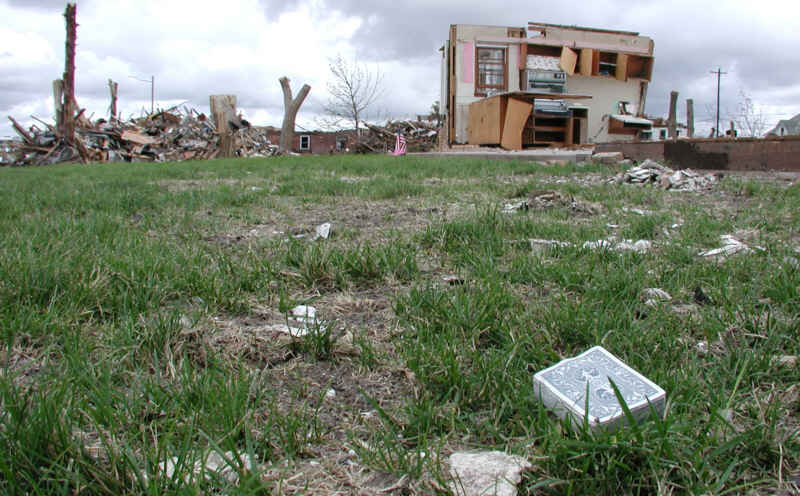 Some claimants have to pursue legal action to get reimbursed for their tornado damage. Much of the information in this article is from: Talking About Disaster: Guide for Standard Messages. Produced by the National Disaster Education Coalition, Washington, D.C., 1999.